What is THE PRO-TECH ANSWER® & what is its purpose? 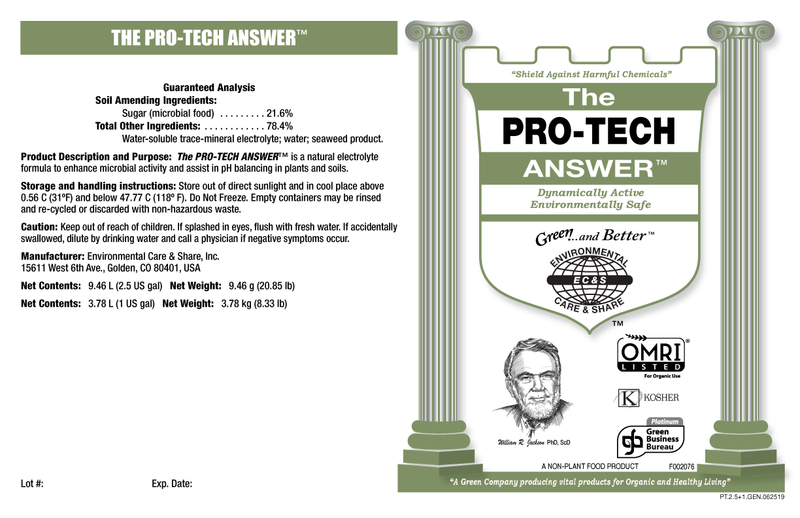 THE PRO-TECH ANSWER® has an immediate impact as it electrically strengthens and enhances a plant's natural resistance against disease and pests through conductivity as well as stimulating plant growth through microbial activity. 5.3 Billion pounds of pesticides are used every year. That being said, THE PRO-TECH ANSWER® offers the best alternative to pesticides and other chemical inputs by helping strengthen a plant’s overall health. Plants that are strong and healthy have a good electric system that repels insects and predators naturally. 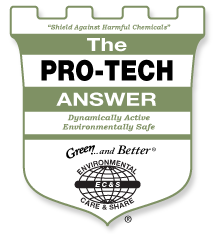 THE PRO-TECH ANSWER® is a leading forefront of innovation when it comes to eliminating chemical pesticides. It takes on the duty of reducing a plant’s stress by building up its overall immune system to naturally fight off disease and pests (through foliar application). 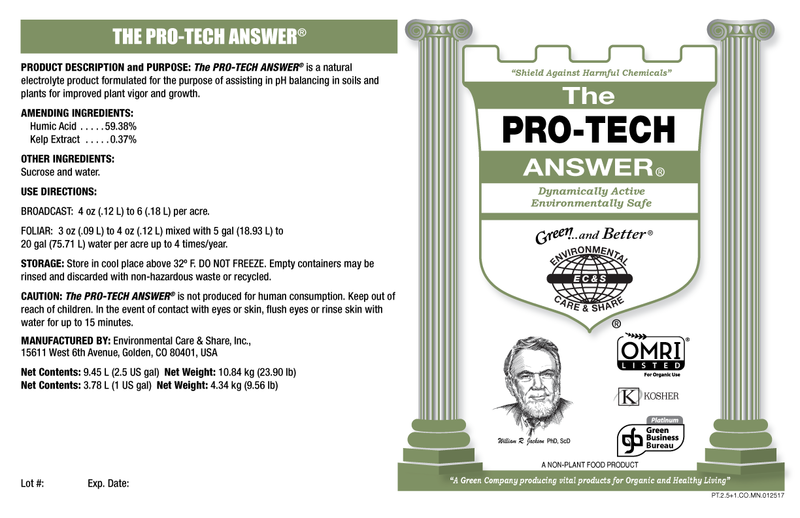 THE PRO-TECH ANSWER® aids in maintaining optimal pH. Too high a pH (alkaline), the more susceptible the plant is to insect attack: Too low a pH (acidic), the susceptibility to localized tissue disease increases. 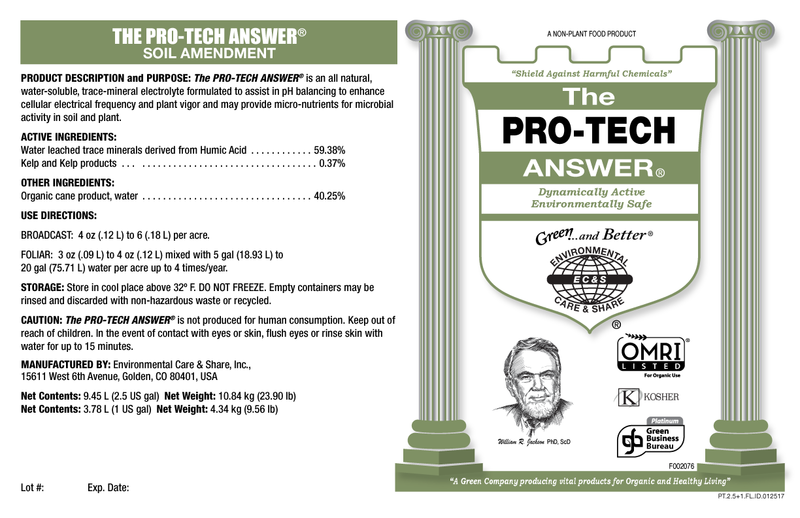 THE PRO-TECH ANSWER® was created to help balance the pH, as it enhances cellular electrical vibrations for improved soil and plant vigor and vitality — including the root & foliage. Chelates or binds soil borne chemicals that cause toxicity to plants' soilhelping improvesugar/carbon to plants. BROADCAST: 4 oz (.12 L) to 6 (.18 L) per acre. FOLIAR: 3 oz (.09 L) to 4 oz (.12 L) mixed with 5 gal (18.93 L) to 20 gal (75.71 L) water per acre up to 4 times/year. Broadcast application. May be added to all irrigation systems. Apply in the row or on the seed. Foliar apply on growing plants & leaves. May be applied alone but for maximum activity, apply with THE NANO–AG ANSWER®. Consult your Distributor for specific application rates and information. Apply anytime. No minimum moisture requirements. Will activate when the rain comes or watering begins. Apply to soil, to seed, or as a plant dusting. An organically approved insecticide (Diatomaceous Earth); known as Amorphous Silica. that makes the host plant unwanted by insects. The trace minerals have proven to be critical in enabling plants to produce complete plant compounds, which allows them to be naturally resistant to pests and disease. THE BIO–N–LIVEN ANSWER®– Improves both soils & plants vigor & vitality. Increasing and stimulating beneficial microbial communities to protect the roots from pests and disease. Contains an organic form of calcium, not a mineral calcium. Sea Kelp– Assists with disease & pest resistance, balancing pH and enhancing nutrient uptake at both the root & foliage. 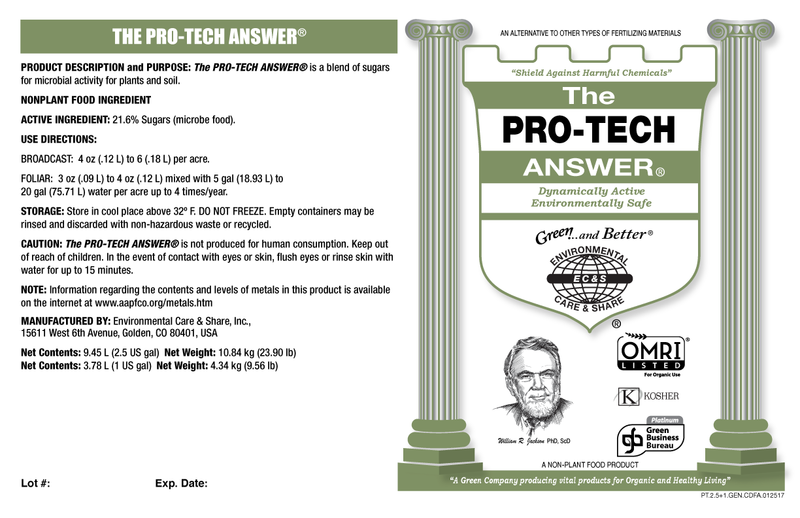 THE PRO–TECH ANSWER® is packaged in two 2.5 gallon jugs per case. Net weight: 20.5 lbs (9.4 Kg) per 2.5 gal jug container and 36 cases (180 gallons) per pallet.